What are the characteristics of periodic motion? How can we study and describe such motion? How can circular motion be related to simple harmonic motion (SHM)? How do we analyse simple harmonic motion? describe simple examples of free oscillations. investigate the motion of an oscillator using experimental and graphical methods. understand and use the terms amplitude, period, frequency and angular frequency. recognise and use the equation a = - ω2 x as the defining equation of simple harmonic motion. describe with graphical illustrations, the changes in displacement, velocity and acceleration during simple harmonic motion. describe the interchange between kinetic and potential energy during simple harmonic motion. describe practical examples of damped oscillations with particular reference to the effects of the degree of damping and the importance of critical damping in cases such as a car suspension system. describe practical examples of forced oscillations and resonance. show an appreciation that there are some circumstances in which resonance is useful and other circumstances in which resonance should be avoided. Examine how different graphs are used to represent SHM. Draw links between the different graphs highlighting the positive and negative values and their interpretation. These will help students to understand SHM as a function of two variables (space and time) and understand the treatment of vector and scalar quantities . Design and carry out an experiment to build a pendulum or spring-mass system to obtain a prescribed period. Present the experimental design, explaining the factors that determine the period of the oscillating system. This provides an opportunity for students to predict and collect data to ascertain the properties of a system and determine whether a motion is considered to be SHM. Students are also to understand that it is necessary for oscillations to be small for the motion to be considered as SHM. Students can also be shown other systems that demonstrate SHM . Simulations    , can also be used for students to investigate these factors. Investigate phase using a turntable or a simulation to associate each position in an SHM with a position on a uniform circular motion. This idea can be extended to the phase difference between different positions in an SHM. The association of SHM with uniform circular motion helps students to visualise many aspects of SHM. Students are to make mental links between three related ideas: physical position and velocity of the oscillator, angle in the associated uniform circular motion and the position of the oscillator on a displacement-time graph . Investigate the motion of a SHM system (pendulum, mass-spring system) using a datalogger or a simulation . Students are to practice observing the motion and interpreting graphs before getting into the mathematical details of the equations. Compare the relationship between the different variables particularly note the values of these valuables at equilibrium position and at endpoints. Students should practice converting one graph into another. Explore how oscillations of molecules bounded by the van der Waals interaction can be SHM if the amplitude is small  . Explore various examples of resonance and discuss the benefits and dangers of resonance. http://youtu.be/VKtEzKcg6_s This video can be used at the start of the first lecture (while students settle down for lecture) to introduce oscillations, to show various modes of oscillations and to interest them. 1.1.2.Q1: what is the maximum angle of release before the motion is not accurately described as a simple harmonic motion for the case of a simple free pendulum? 1.1.2.A1: : 10 degrees for error of , depending on what is the error acceptable, small angle is typically about less than 10 degree of swing from the vertical. 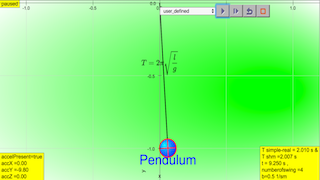 Explore some factors that affect the period of a pendulum. Press the play button. 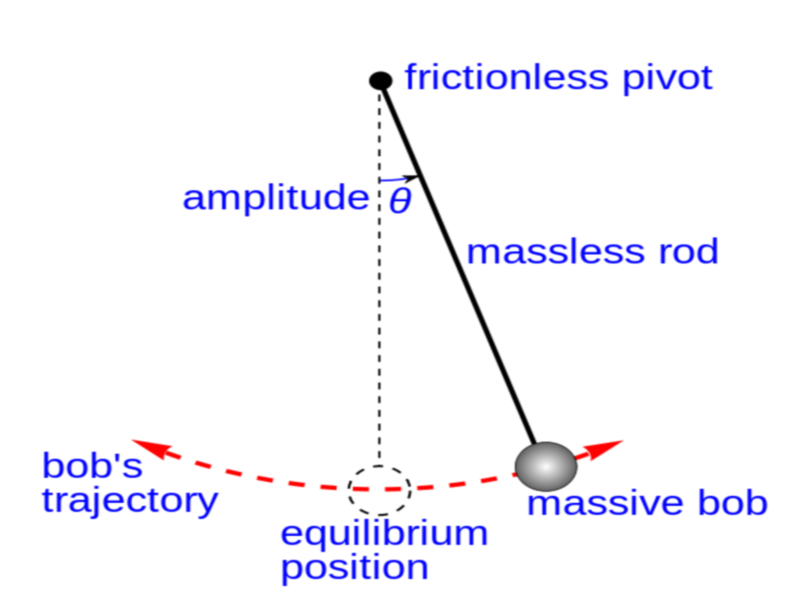 Watch the graph to see how the angle of the pendulum changes as it swings back and forth. Use the graph to determine the period of the pendulum. Adjust the scale by dragging the numbers on the axes. Change each variable – gravity, rod length, starting angle and mass – and observe how each one affects the period. Can you explain why? Try the damping slider. Does damping change the period?